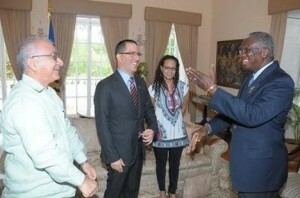 BRIDGETOWN, Barbados - Current chair of the Caribbean Community (CARICOM), Barbados Prime Minister Freundel Stuart, on Friday met with Jorge Arreaza, vice president Venezuela, who was in Barbados as part of a regional tour to discuss Venezuela’s territorial and maritime claims in the region. During their discussions, Stuart emphasised the need to maintain peace and stability as the basis for enhancing regional cooperation and the development of both Guyana and Venezuela. He welcomed Arreaza’s visit to Barbados and the Caribbean as a tangible demonstration of Venezuela’s commitment to those ideals. Stuart reiterated the position adopted by CARICOM heads of government in July and restated Barbados and CARICOM’s total support for the integrity of Guyana’s territory and maritime space, as well as that of all CARICOM states. He said that Barbados stood by Guyana as it sought the best means to address this issue. “We cannot contemplate such an end if we do not have a mechanism in place, for in the event the peaceful solution we prefer does not happen, an alternative mechanism can be sprung into action that can settle the matter by juridical means,” he remarked. Stuart told Arreaza that Barbados acknowledged that Venezuela had issued a new decree, namely Presidential Decree no 1859 of July 6, 2015, which had replaced Decree 1787. He informed that the new Decree was being studied by CARICOM experts. Stuart emphasised the importance to Barbados of its relationship with Venezuela. He welcomed the efforts at communication on the part of the government of Venezuela.